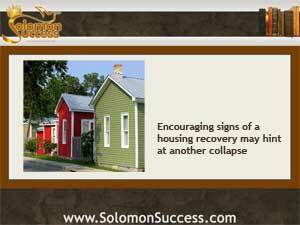 Solomon Success > Blog > Does the Housing Rebound Signal a Coming Crash? Does the Housing Rebound Signal a Coming Crash? In today’s recovering housing market, a growing number of industry professionals are doing just that – viewing the current positive signs of a housing upswing in light of their implications for the future – and the potential of those very signs to signal another collapse. It’s taken a while for housing to make its way back toward normal after the bottom fell out of the market back in 2008. And by many indicators, the picture is improving: new home starts are up, and so are prices for existing homes. But housing doesn’t exist in a vacuum. Those factors are linked to the health of other sectors of the economy as well. Home purchases boost sales of consumer goods and create jobs. A stronger employment picture, in its turn, makes people more willing to consider buying houses. Along with the low interest rates of the last year or so, these circumstances fueled a rise in both new home starts and existing home purchases. But according to a recent Huffington Post report on the recovery, the number of housing purchase contracts fell in July 2013 for the second straight month — numbers which, along with the quick rise in home prices, lead some industry professionals to claim that the housing market is facing not just a slowdown, but also the possibility of another full blown collapse. Why the gloom? Pessimists blame low interest rates, rising home prices and a continued lack of oversight in mortgage lending – some of the same factors in place before the first collapse. Interest rates have remained at virtually unprecedented low levels for a surprisingly long time, thanks largely to the Fed’s massive stimulus effort. Those rates attracted new homebuyers who wouldn’t have been able to make a purchase at all if rates had been higher. With more activity in the markets, home prices began to rise, too, in some areas reaching highs not seen for years in the space of a few months. Now, though, interest rates are rising, and they’ll continue to do so as the stimulus plan wanes and natural market forces take over. Those higher rates are already locking some potential buyers out of the purchase process, and experts fear that the combination of higher prices and higher rates could grind the recovery to a halt, because fewer buyers are able to make a purchase. Add to that the ongoing concerns about accountability in mortgage lending. As lawsuits for bank fraud keep coming against the nation’s big banks, new mortgage lending standards such as the Qualified Mortgage Rule tighten eligibility requirements. That, too, say worried experts, could slow the recovery to a crawl even as it aims to reduce the likelihood of another landslide of defaults. Pento, Michael. “Housing Recovery in Jeopardy.” Huff Post Business. The Huffington Post, 27 Jul 2013. New Home Construction: Slowing the Housing Recovery? New Fraud Charges Coming for Chase Bank? Learning from the Past: A New Housing Bubble?